South Orange and West Orange have some great restaurants that are known to serve a fantastic Thanksgiving dinner. Whether you are looking to having your feast delivered to your apartment or want to dine out, you’ll find it all around The Castle. McLoone’s Boat House – If you’re looking to spend time with your loved ones this Thanksgiving without all the work, then you’ll want to make a reservation here ASAP! They have an enticing buffet menu which consists of holiday favorites such as butternut squash soup, turkey and ham carving stations, maple salmon, sweet potato baked, mashed potatoes, traditional herb stuffing and more. McLoone’s Boathouse sits on the banks of the reservoir, showcasing spectacular views to our customers. Highlawn Pavilion – Situated at the top of Eagle Rock Reservation, the Highlawn Pavilion is known as one of the best restaurants in New Jersey. In their bar area they have live music and you can also enjoy views of the New York City skyline from their beautiful patio which is right off the bar. Their Thanksgiving menu is a 4-course meal which includes an appetizer, salad, entrée (roasted turkey, Norwegian salmon, striped bass, lamb shank or filet mignon) and a dessert. Ashley’s Marketplace – They’re serving a delicious Prix-Fixe Thanksgiving dinner which includes soup, whole roasted turkey, cranberry sauce, gravy, two vegetable choices, dinner rolls, and a pie. 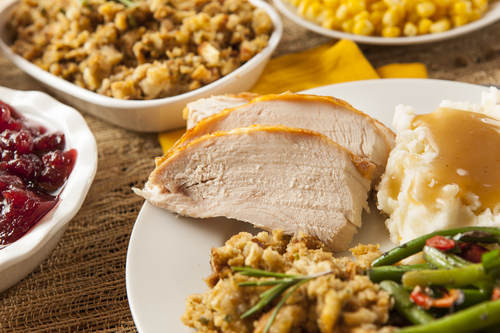 The all-natural turkeys available include 8-10 lbs, 10-12 lbs, and 18 lbs. Kosher and organic turkey also available. Local delivery is available through Thanksgiving Eve, or you can pick up on Thanksgiving Day from the shop before noon.